Sometimes it’s just the simple things that make you feel content.Here’s one of my shallowest. You know that feeling when you’ve just ‘brimmed’ your car full of petrol? That feeling of independance you have like ‘I could take off to *name destination here* right now and be there in no time’ (An important mental factor for some of us who find ourselves in places we don’t want to be). A liberating feeling. Recently we replaced our old steam-driven fridge-freezer at home. The plan was to throw the old one away…but no! It now has pride of place in the garage…It is now a BEER FRIDGE! We had a party at home the other week. In the afternoon I spirited two crates of beer into there – all lined up like little soldiers. Oh what a feeling! 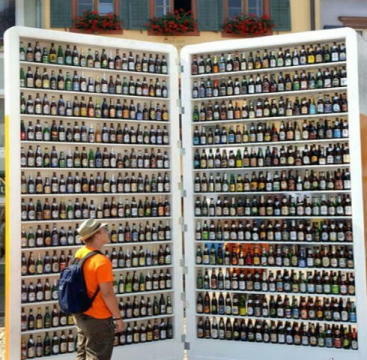 I took several guests into the garage to view my new BEER FRIDGE! My life is now enriched and enhanced. I feel at peace. I am wondering does this beer fridge image exist in higher resolution? I can’t see any image there. Your guess is as good as mine but I’d like to think so!